A cathedral in Kosovo dedicated to Mother Teresa of Calcutta was consecrated on Tuesday, the 20th anniversary of the Saint’s death. The ceremony at St Teresa Cathedral in Pristina was attended by the Kosovo President Hashim Thaçi and religious leaders from Kosovo and Albania. The building of the cathedral was begun in 2007 and by 2010 it had become a place of worship for the small local Catholic population. A shrine to the saint forms part of a design which also includes stained-glass windows depicting St Teresa with Pope St John Paul II, and Pope Benedict XVI embracing Pope Francis. On 4 September 2016, Pope Francis canonised St Teresa, who was known within her own lifetime as the ‘Saint of the Gutters’, during a Mass in St Peter’s Square. There are roughly 65,000 Catholics in Kosovo, out of a population of approximately two million. Most Kosovars are ethnic Albanians, like Mother Teresa, and almost 95 per cent are Muslim. On Tuesday, Pope Francis cited Mother Teresa in his appeal for “opportunities of joy and hope for the many who are discouraged and need understanding and tenderness” in a message tweeted across his nine different @Pontifex Twitter accounts to mark the 20th anniversary of the death of the Saint of Calcutta known as the ‘mother of the poor’. Separately, the Archdiocese of Kolkata is to make St Teresa a co-patron of the diocese today (6 September) at Mass in the Cathedral of the Most Holy Rosary. Sr Prema, Superior-General of the Missionaries of Charity, announced the news at the inauguration of an exhibition of paintings and sculptures on Mother Teresa organised in Kolkata by the Indian National Forum of Art and Culture in association with the Indian Council for Cultural Relations (ICCR) and Church Art to commemorate the first anniversary of the Nobel laureate’s canonisation on 4 September as well as the 20th anniversary of her death on 5 September. The exposition by upcoming artists will be taken to different cities across India. Mother Teresa was born Agnes Gonxhe Bojaxhiu on 26 August 1910 to Albanian parents in Skopje, in ‎what ‎is ‎Macedonia today. As an 18-year old, she chose to become a missionary and joined the Loreto Sisters in Ireland. She was then sent to Darjeeling and Calcutta in ‎‎1929. 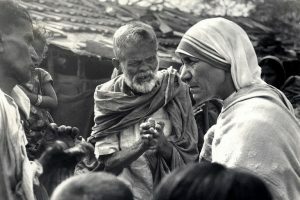 In 1946 she received what she described as a “call within a call” to found a new order dedicated to caring for the most unloved and unwanted, the “poorest of the poor” in the slums of Calcutta. 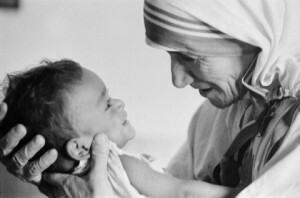 Mother Teresa earned many national and international honours, including ‎the ‎Nobel Peace Prize in 1979, for her works of ‎mercy. She died on 5 September ‎‎1997 at the age of 87 ‎and ‎St ‎John ‎Paul II declared her Blessed on 19 October 2003.